Dell XPS 15 vs Razer Blade 14 - which is the better pick? 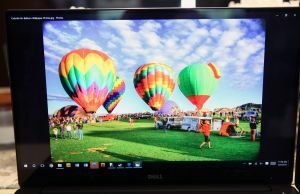 Dell XPS 15 vs Razer Blade 14 – which is the better pick? Since I’ve had my eyes on the Razer Blade 2016, I’ve spent quite a bit of time on the Razer forums and I’ve noticed that there is quite a crowd that loves this product. But for some people, the Razer Blade doesn’t fill in all the gaps and I’ve noticed that their next logical choice is the Dell XPS 15. 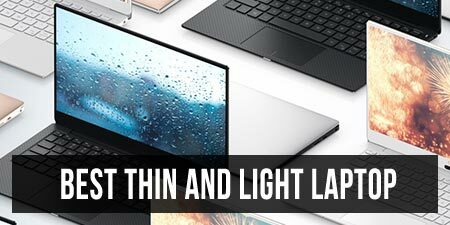 Yes, the two are nearly the same size, but that’s interesting to me because I don’t consider the XPS 15 a gaming laptop all that much, and there are actually plenty of other thin gaming computers out there to choose from (like the MSI GS60, among others). 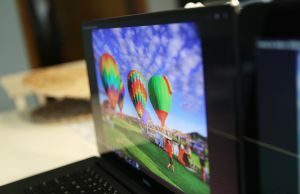 But as far as portability with a dedicated GPU goes, the XPS 15 is sure to be at the top of people’s lists. 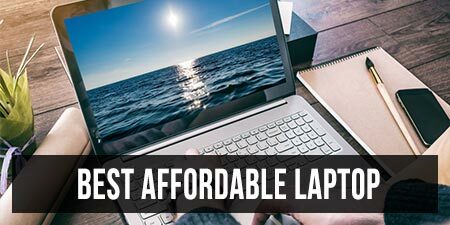 There are quite a few pros and cons to each laptop, so choosing between them can be a hard decision for some of you. Since I happen to have both, I figured I’d write up a side by side comparison. Here’s how I see things. Both of these laptops are very solidly built, so it’s hard to pick a clear winner in this category. On the outside, you’re dealing with the all-aluminum feel on both laptops. Carrying both around feels pretty much the same, due to their similar sizes and weights. The Razer Blade feels a little more balanced to carry, but not by much. 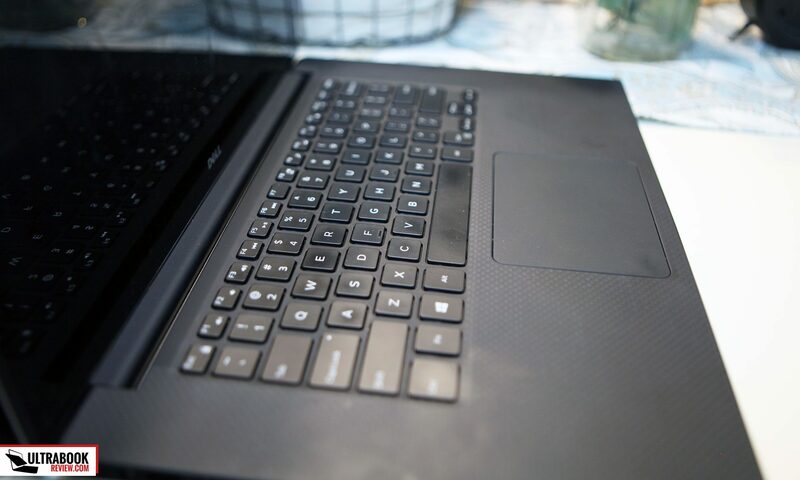 With the Razer Blade, you pretty much have a uniform material all around the laptop – black aluminum. The only plastic portion is the housing for the hinge, which shouldn’t ever get touched really. The edges are not as chamfered as I would like, but the laptop rests so low that your wrists hardly come in contact with them when your palms are resting below the keyboard. The XPS 15 is metal all around the outsides, but the palm rest area is made of a fiberglass material. It’s a very soft feel, which I like, especially since it’s not as prone to being too cold or hot like metallic palm rests do (like on the Razer Blade). The edges are properly rounded as well. 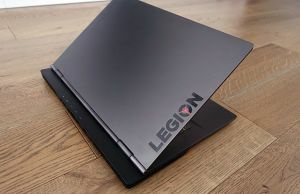 Like I already said, both designs are great, but there are a couple pros and cons to each laptop that would probably make you choose one over the other. The first of which is the screen size. You can see in my overhead picture that the XPS 15 has a slightly larger footprint, by about .5”. That might make you think the Razer Blade is superior until you see the difference in screen sizes. To be quite honest, I would gladly take that extra half an inch width for a jump in screen size. We’ll get more into the screen differences later. Another design difference to consider is the color. The reason I say this is because black aluminum is pretty much a fingerprint magnet. I apologize for how dirty my pictures look, but I actually did this on purpose. I normally clean the laptops for a photoshoot but I wanted to show you what these laptops look like under normal use. 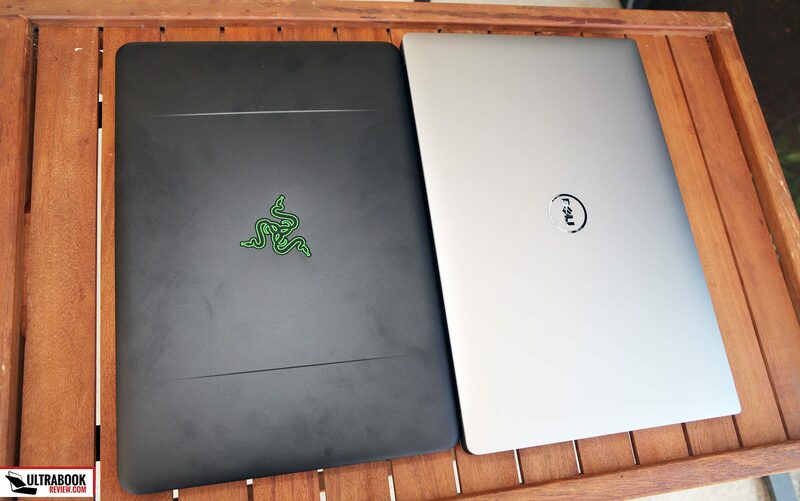 As you can clearly see, the Razer Blade looks like it has finger prints all over it, while the XPS 15 pretty much looks clean. The only part of the XPS 15 that shows signs of use is the palm rest, but it’s a pretty simple task to wipe it off every now and then. The Razer Blade can also be wiped up, of course, but aluminum is not as easy to keep clean considering the surface finish is matte. 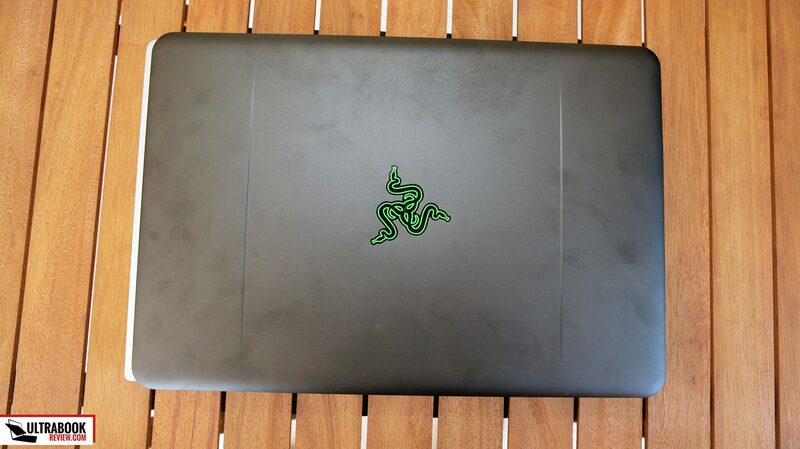 Besides the Razer Blade logo, both laptops can pass off as being professional. Although the Razer Blade logo light can be shut off now, it’s still mildly lit by the screen backlight, so in a dark room you can still see some green. If that kind of stuff bothers or embarrasses you, it’s something you should heavily consider. As far as size goes, the reported specs are almost identical, but I give a win to the Razer Blade here. Even though the XPS 15 is “reported” as thinner, it stands a little higher on the tabletop than the Razer Blade. But wait, why is that? Are the foot stops actually larger? Actually, no. 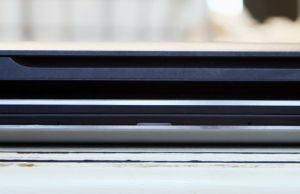 I say “reported” as thinner because the actual thickness of the XPS 15 is significantly larger than stated. Using my calipers on the thick end, I measure a maximum thickness of 20mm(.79”). That’s 3mm bigger than their spec states. They also did this crap with the XPS 13 which is why I bothered measuring(btw, they also lie about their battery life claims). This isn’t including the footpad, in case you were wondering. With the footpad, the highest portion of the lid stands 22.9mm(.9”) off the tabletop. The Razer Blade on the other hand is pretty much symmetric, which I really appreciate since I like to rest things on top of my laptop when it’s closed. Razer stays true to their word on thickness dimensions, with a uniform height of 17.9mm(.7”). If you add in the footpad, it stands 20mm (.79”) high. The Razer Blade is a tad lighter than the XPS 15. I honestly can’t tell the difference, in all practical senses. But all the weight in your bag adds up and lighter is certainly better. If you’re carrying your charger as well though, the combined weights come within 15 grams. So in that case, consider them equal. The last thing I can compare with the design is ease of use, which I can also lean towards Razer for. Because of its symmetry, I can more easily pick up the Razer Blade and go. I can pick up both with one hand, don’t get me wrong, but it’s just easier to grab the Blade. Also, it’s MUCH easier to open the Razer Blade than the XPS 15. Really, with the XPS, it takes two hands. This is mainly because Razer added a cutout in the unibody to stick your finger in, where Dell did not. The hinge also plays a role. May not be a big deal to some of you, but I personally find it annoying when laptop manufacturers ignore that. Typing in general is a pretty similar experience for me. I took typing tests on both machines and I scored almost equally. 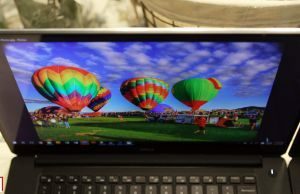 I’ll give a slight edge to the XPS 15 as far as usability because I was able to adapt quicker, as the keys felt more “normal” to me. It’s not to say the Razer Blade keyboard is bad, but it’s not the typical keyboard I’m used to seeing and it took some practice to type on it well. Both are backlit, but a big advantage goes to the Razer Blade based on how much customization there is to the keyboard backlighting. 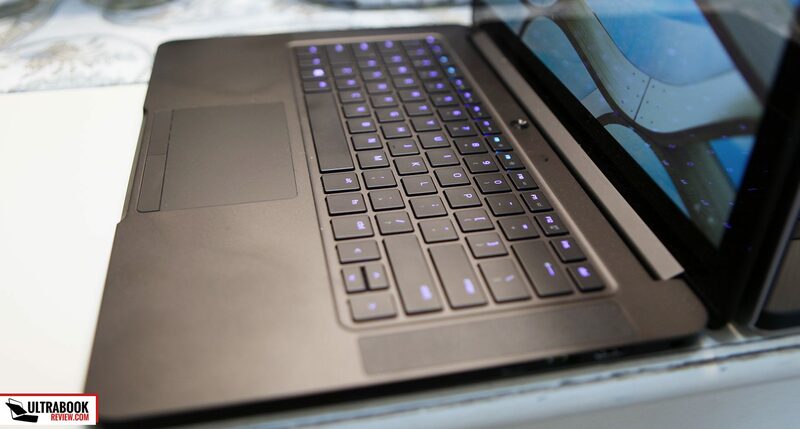 On the Razer Blade, there are about a 20 backlight brightness levels and millions of color options for each key. On the XPS 15, it’s only white backlighting with only a couple brightness levels. Even without the Chroma, the Dell keyboard is going to be good enough for almost everyone. But the backlighting also brings forth a disadvantage to the Razer Blade though. This is because they neglected to offer backlighting to the secondary keys and multimedia functions. I’ve honestly never seen this be neglected before and I find it quite annoying. If I wasn’t able to change the colors of some of the multimedia keys in order to distinguish them from the others, I might me even more irritated. It helps that I know the location of all the symbols on the number line, but those who don’t will definitely struggle with this keyboard in the dark. In the end, I would gladly give up Chroma for a “fully backlit” keyboard. So I’ll give the XPS 15 a win in this department – but not by much. Both are good keyboards but I just think some heads will turn away from the Razer Blade because of their mistake. Another difficult comparison comes with the trackpad comparison. Both are really good with the sense of tracking my finger movements and registering multi-touch gestures. Both trackpad surfaces are also very smooth and feel like they are good quality materials. But there are a couple things that sway me into liking the Razer Blade a little bit better. One of the biggest advantages is the brand. The Razer Blade has a Synaptics trackpad, while the XPS 15 has a Microsoft Precision Touchpad. So the customization options with the Razer Blade are far more vast and better to my liking. 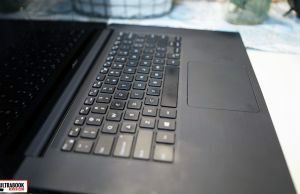 There are couple gestures that the Razer Blade is still missing, which I covered in my Razer Blade review, but they are easily restored with some registry tweaks. Unfortunately, with the XPS 15, you’re stuck with what Microsoft lets you change. Some people might find the buttons on the Razer Blade to be a slight advantage as well. They are pretty small though and have a pretty short travel. I personally find them difficult to find sometimes, so I opt to use a two-finger tap for right clicks. But it is nice to have them for those instances when I actually need them. The XPS 15 is a click pad, so right clicking is also via double-tap or clicking the lower right hand corner of the trackpad. I’ll give Razer the prize in this department, solely for having a trackpad with more customizing options. If not the video card(which I’ll get into next), the screen will be what most likely drives your decision. 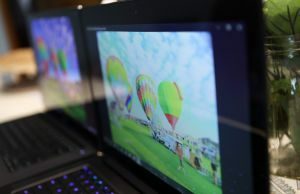 The Razer Blade has a 14” Sharp IGZO 3200×1800 screen, while the XPS 15 has a 15.4” Sharp IGZO 3840×2160 screen. 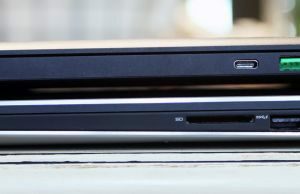 Different sized screens are usually apples and oranges in some comparisons, but in this case, it’s a major difference because the laptops are almost the same overall size. There are a lot of differences in the two panels and the XPS 15 wins in most of them. First off is the color gamut. 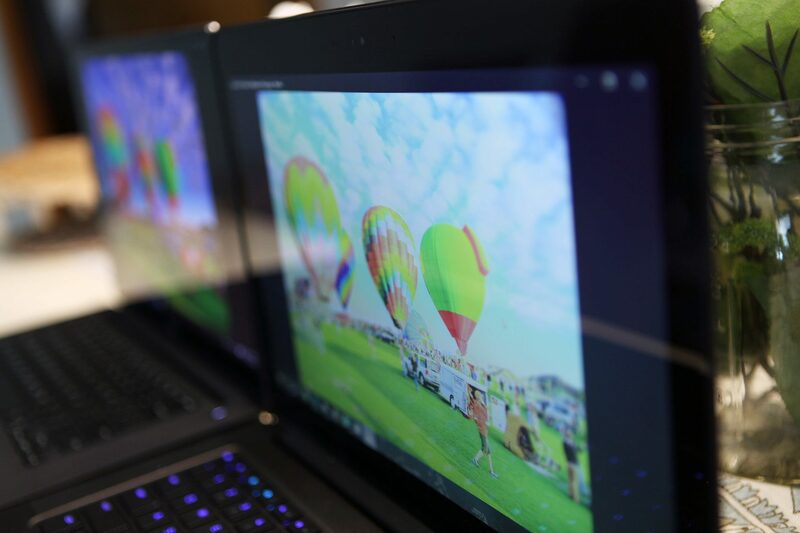 The Razer Blade has a normal gamut IPS screen, measuring 98% sRGB, 69% NTSC and 75% aRGB. 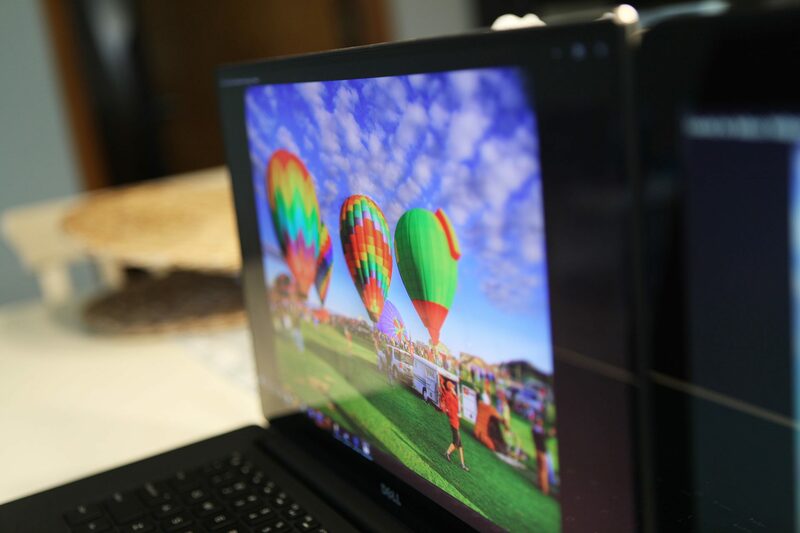 But the XPS 15 takes it a step further with a wide gamut display, measuring 100% sRGB, 95% NTSC and 100% aRGB. Screen brightness and contrast ratio also favor the XPS 15. 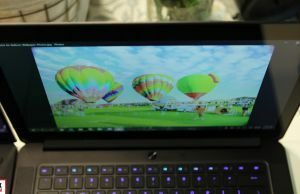 Average brightness on the XPS 15 was measured to be 275 nits while the Razer Blade averaged 291 nits. Minimum brightness on the XPS 15 was 16 nits vs Razer Blade’s 25 nits, so not much difference there. The contrast ratio on the Razer Blade was measured to only be about 300:1 though, while the XPS 15 was measured to be 600:1. Now at the time of writing this article, I had reached out to Razer about the screen, mainly because I remember the panel being a lot brighter in the 2014 model. Turns out they think I have a defective screen, so I should be getting a replacement. My levels are supposed to be 300-320 nits with a contrast ratio of 1000:1. If I get any improvement on my new unit, I’ll be sure to update this section. I did get my replacement and my last screen was indeed defective. The brightness is now more like it’s advertised to be. The contrast ratio is nowhere near 1000:1 though, mainly because the blacks are lit up so high from the backlight. Moving on to the viewing angles, the XPS 15 also wins there. Even at the most extreme angles, I’m able to see a clear image with good colors being held, on the XPS 15. 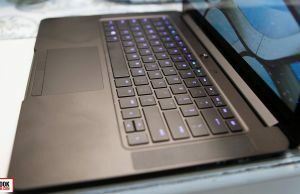 The Razer Blade is not terrible, but not great either. Once you start to take the extreme angles, particularly horizontal, the colors start to fade to white. See the pictures to see what I mean. I did some research on the response time/ghosting of the two panels. I found some testing on the XPS 15, which varied with results ranging from 40-56 ms. Unfortunately I couldn’t find a single test on the Razer Blade, so I can’t give you an accurate number. The only number I can supply is on the panel specification, which is 25ms. But that number can’t be trusted alone, because there is a little more that goes into it. What I can do though is test them side by side with a ghosting test and snap some pictures. If you count the UFOs in my pictures, the more you can see, the worse the ghosting is. I tested it under two different pixel speeds, just to be sure. 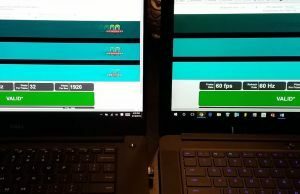 Both tests were run under the same conditions and it’s clear that the XPS 15 suffers from ghosting more than the Razer Blade does. If FPS games are your thing, the Blade is the better pick for you. So there it is, the screens are very different. 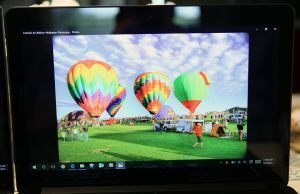 If it weren’t for the ghosting, the XPS 15 screen is a clear winner in almost every way. I didn’t even mention the bezels(do I even need to?) but that fact alone makes the XPS 15 a much more attractive option. 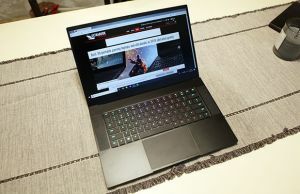 Don’t get me wrong though, the Razer Blade still has a very nice screen and I’m sure most people will really like it – it’s just not as good as the XPS 15. There’s very few similarities between both units, in terms of hardware(at least in my configurations). They both support wireless AC and Bluetooth 4.1. The wireless cards are different brands but I can’t really say if one is better than the other by all that much. As for the Ram, they both have 2133Mhz DDR4 modules but the XPS only has 8GB while the Razerr Blade comes with 16GB. Storage options are pretty limited, due to the size of the machines. The Razer Blade has a single PCIe, a Samsung PM951, with either 256 or 512GB capacity. The XPS 15 has the same SSD actually, with an additional option for a 1TB version. There is also an open 2.5” bay, but if you decide to use it, you’ll have to sacrifice the 84Wh battery for a 56Wh one – so choose wisely. 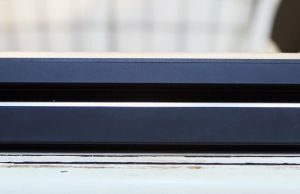 One other thing to mention about the storage is the M.2 slot. On the Razer Blade, the slot is only compatible with PCIe drives, not Sata. The XPS 15 is compatible with both. I can’t really figure out why the Razer isn’t compatible, to be honest. It should be and it might just be a matter of a bios option. Unfortunately, that option isn’t available though and it would require a modified bios in order to find out. Another difference in the two is the CPU choices. Both support the i7-6700HQ, but the XPS 15 I have is only an i5-6300HQ. The difference is significant, as seen in the PCMark scores. It’s probably not a whole lot of difference for normal use, but if you play games or do heavy tasks, you might prefer to stick with the i7 version of the XPS 15 or stick with the Razer Blade. For connectivity options, both machines are pretty similar. The Razer Blade has third USB 3.0 slot, while the XPS 15 only has two. Both have HDMI and a Thunderbolt 3 port. The big thing the XPS has over Razer is an SD card slot. Year after year Razer omits this from their design and I can’t figure out why. Probably the most significant difference in the two machines is the GPU. 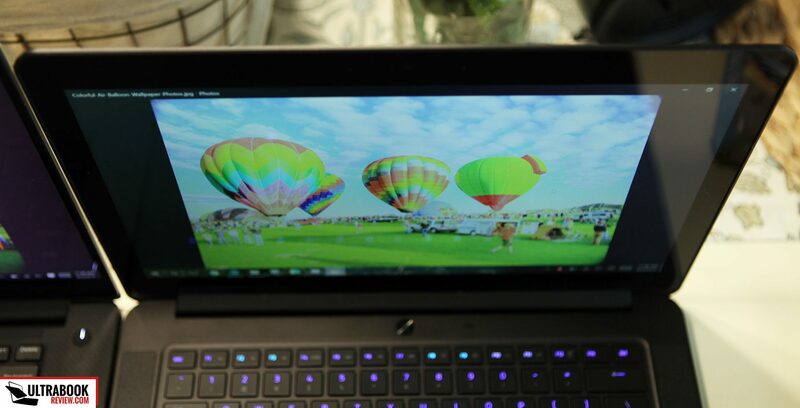 The Razer Blade includes an Nvidia 970M with 6GB of VRAM. The XPS 15 only has an Nvidia 960M with 2 GB of VRAM. These two choices will likely heavily impact your decision, and rightfully so. 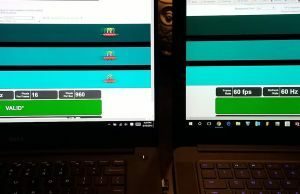 I ran a number of benchmarks and games for both machines, under similar conditions. Actually, I took a lot of these specs from my Razer Core article. As you can see, though, the numbers speak for themselves. 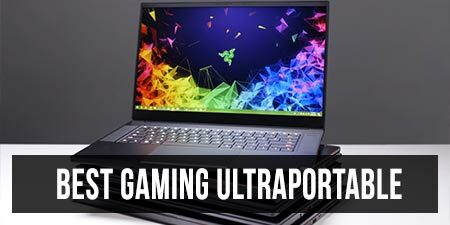 There is a big advantage in choosing the Razer Blade over the XPS 15 when it comes to gaming. Fan noise is pretty good for both machines. The Razer Blade gets a little louder when gaming, but that should be expected considering it’s cooling a 970M instead of a 960M. Under normal use, I measured about 30dB for both machines. For gaming, the XPS topped out at 45dB while the Razer Blade was around 50-55dB. The surface temperatures were nearly identical between both units as well. Throughout the usage I gave them, I couldn’t tell the difference between the two actually. Gaming is a little different though. As I stated in my review, the Razer Blade can get pretty hot under load, reaching a peak temp of 54C on the center underside. The XPS didn’t get nearly as hot and only topped out at 45C. Internal temps also differentiated while gaming. The max temperatures I recorded in the Razer Blade were 86C for the CPU and 87C for the GPU. The XPS 15 maximum internal temperatures were 71C for the CPU and 75 for the GPU. Again, this is obviously because of the CPU and GPU configuration, so if you want more power, you’re stuck with the higher temperatures. Both laptops’ speakers are pretty average at best. They both get plenty loud enough but also lack bass. The XPS 15 gets a tiny bit louder but the sound is a little distorted at that level, so it doesn’t matter. 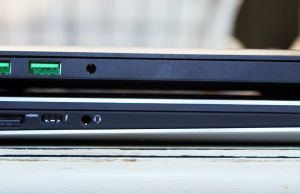 The main difference is the Razer Blade speakers face up, while the XPS 15 speakers face down. So the sound on the XPS 15 is a little more muffled. As you can see, the XPS 15 is slightly more favorable for battery life, but not by a whole lot. This is pretty much expected since the battery on the XPS 15 is a little bigger. However, if you opt for XPS model with the smaller battery and the extra 2.5” bay, chop these times by 1/3. There’s very little to upgrade on the Razer Blade. The M.2 SSD is removable but it only supports PCIe, so you’re pretty limited to what you can change it to. You can also swap out the Wifi card I suppose, but there’s little reason to since it works so well. The Ram is soldered onto the board, so you’re pretty much stuck with what you get. The XPS 15 has a couple more options at least. The SSD is also removable but can be replaced with either a PCIe or SATA M.2 drive. There’s also a 2.5” bay, however to even access it, you need a different, smaller battery. So unless you have that battery on hand to swap out or buy the smaller battery version to begin with, you’re not using the 2.5” bay. The Ram is upgradable, with two slots, allowing you to upgrade to 16GB in the future. 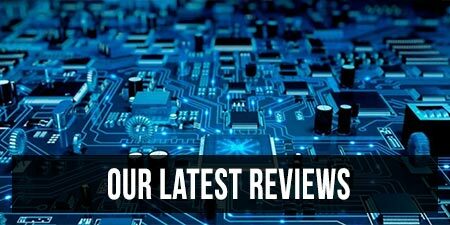 At the time of this review, you can find the XPS 15 configuration that I have for approximately $1650. There are also many other configurations you might be interested in, including an i7 version and even non-touch versions with a FHD matte screen. 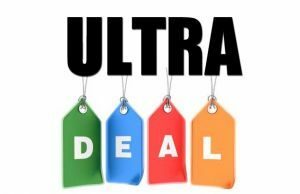 You can check them out and their latest prices here. Personally, I would steer clear of the Core i3 version, that’s going to be a bit slow for what you’d probably expect from this laptop. The Razer Blade is still on backorder on Razer’s website, but is available on Amazon for around $2000 at the time of this post, for the 256GB version. The 512GB version will set you back another $200. If you’re comfortable with upgrading the SSD yourself, it’s going to be more cost effective to buy a 512GB Samsung 950 Pro and install it. So when it comes to pricing, this is another section where the XPS 15 looks a little more attractive. Even with Razer’s $400 price cut from last year, it’s still more expensive. 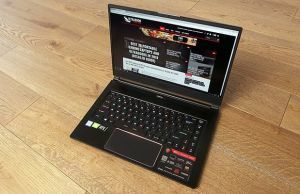 And rightfully so, because the base version includes a Core i7 processor and an Nvidia 970M chip. Making the prices equal, at $2000 you could get the XPS 15 with a Core i7 CPU, a 4k screen, a 512GB SSD and 16GB of RAM. In that configuration the only advantage the Blade retains would be the GPU so unless you’re a gamer, in my opinion the XPS 15 still is the better value pick here. After reading all that, it should probably be an easy choice now, right? Maybe for some of you, I suppose ,but I think others might still be finding it difficult to choose. Lucky for me I don’t have to choose because they are both great laptops. I think it’s really going to come down to whether or not you prioritize playing games over looks, specs and screen space. The biggest pro for the Razer Blade is the 970M graphics chip. It’s so much faster than the 960M in the XPS, especially since the 960M only has 2GB of VRAM. Anybody who takes games seriously should lean towards the Razer Blade, just because of that. There’s also the Chroma keyboard, better trackpad and the Razer Core compatibility to consider. But those who don’t have gaming as such a high priority might see the benefits the XPS 15 has to offer over the Razer Blade. The screen, for example is vastly superior, as long as you don’t care about ghosting. Losing the bezels is a great feature as well. And it does help to have extra storage options, a larger battery and even a SD card reader. Here’s out detailed review of the Razer Blade 14, if you’re interested in more details, and over here you can find our detailed review of the Dell XPS 15 9550. Another thing to consider are the upcoming GPU docks. I didn’t discuss this above, but I did cover in another article how both of these laptops work with the Razer Core. There’s also the Dell dock, which has been reported to be pretty buggy. Even the BIOS changes for Dell haven’t fixed all the issues with the XPS 15 connecting to Thunderbolt docks. So if your intent is to use a Thunderbolt 3 dock or external GPU, you might want to tread carefully when choosing the XPS 15 – YMMV. Still, either way you go, you’re going to be envious of the other in some way, shape or form. Luckily I have both…well, the XPS is my wife’s, but I get to look at it every now and then. I’ll admit, I do find myself envious of her nice big full gamut screen, every time I see it. But I don’t think I’d trade that and drop to a 960M though. If both of these companies would just team up and fuse these two together, you’d probably have the first “perfect laptop”. That’s about all I have to throw out there for you. I hope you found this informative and maybe it helps you decide which to choose. If you think I missed something or would like to comment on the article, I’d like to hear from you in the section below.